Working in the dental profession is a really good gig. I get to reconnect with my coworkers daily, see long-time patients become friends, and meet new patients each day, which is all more meaningful than any filling, bridge prep, or immediate complete upper denture. I hope to help our patients attain better health through collaboration, the latest effective dental techniques, and our office’s ability to provide a high-quality, stress-free, easygoing, and sometimes-snoozy dental experience. Here at South Hill Family Dentistry, you just never know when I’ll tell a dumb dental joke, break into song, or one of our dental assistants will share a laugh at my expense concerning my dumb dental joke. Most days, our energy is upbeat and we’re looking for ways to help you experience a less stressful, easy-on-your-knuckles (and on our chair handles) type of dental experience. I consider my career as a dentist a long and winding road. I started out this journey as a very young person in Wisconsin, and moved to Santa Rosa with my family when I was nine. I remained in California until I was accepted to dental school. My dental journey started at Marquette University School of Dentistry (from 1972 to 1976), followed by three years in the Air Force as a general dentist. After that, I was involved in a couple of associateships in Northern California, and my own dental business in Redding. Along the way, I was distracted from the business of dentistry by photography and sold my dental business and moved to Santa Barbara for photographic study and part-time work as a dentist. When I’d completed school, I moved to the LA area to pursue my photographic interest, but continued to work as a dentist. After a couple of years, it became apparent to me that dentistry was calling me back full time. I moved to the Seattle area in 1994 and worked as a guest dentist, and became involved in various associateships. 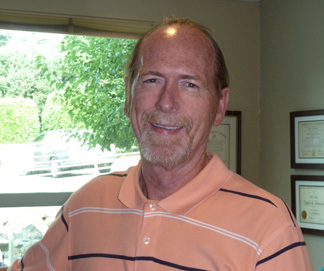 Two of those relationships were with the owners of South Hill Family Dentistry: the late Dr. Dave Smith and then Dr. Rob Radz. After Rob became ill, I assisted in the office a couple of days a week, starting in late September 2010. I have been involved in many areas of dentistry: my local dental society, and volunteering for various public-service dental activities such as the Swedish Community Specialty Clinic, Seattle/King County Clinic, National Children’s Dental Health Month, and Dental Action Day. All along, my dental education progressed, culminating in my master’s certificate from the Academy of General Dentistry in Nashville, in June 2013. I am married to Monique Nadeau, who works for MultiCare Health System. We live in Tacoma with our cat Neko. Monique has two grown sons and we have two grandsons that rule the house when they visit. My pastime activities include going to the gym, yard work and house maintenance (a necessity), bike riding, photography (mostly appreciation these days), socializing with friends, and all those other things too numerous to mention that seem to occupy one’s day. In the past I have been involved with the Sierra Club, especially a sub-group called Inner City Outings Program. These days, my civic interests have me involved with South Hill Rotary Club.